This week, Microsoft unveiled the Surface Pro 3 with a larger, 12" display and surprised some by holding off on a "Surface Mini". While Microsoft continued to harp on their "best of both worlds" mantra, it was very clear that this device was focused on productivity use cases and enterprise users. Does this signal a new era in tablet computing or is this simply a niche product? I recently downgraded my tablet sales estimate because tablets haven't encroached upon productivity use cases as quickly as "phablets" have encroached on consumption use cases. So wouldn't the Surface Pro 3 fit with my definition of upmarket movement? Not quite. The challenge for tablets is to move upmarket into productivity use cases without compromising on their advantages over PCs -- 1) ease of use, and 2) lower price points. With the Windows 8 operating system and a price tag starting at $930 (incl. 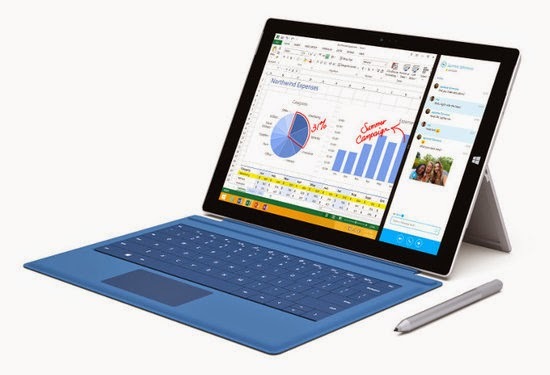 the keyboard cover), the Surface Pro 3 misses on both points. The primary selling point of the Surface is access to legacy applications which are practically unusable without the keyboard cover (the fact that this is still sold as an optional accessory is puzzling). In other words, the Surface is not a tablet, but an ultraportable PC or "ultrabook" which happens to have a touchscreen. The product has been designed to cater to a very niche segment of enterprise users, i.e. users who have already decided to purchase a portable PC over a tablet. This leaves no room to move upmarket and no flexibility to move downmarket. The sub-par mobile app ecosystem for Windows Phone/RT limits downmarket movement as well. That said, focusing on enterprise PC users may be a conscious decision by Microsoft. The lack of a "Surface Mini" announcement tells me that Microsoft is beginning to understand their position in the mobile industry. This strategy is unlikely to be a major success, but could drive just enough sales to keep the product line alive.